Why are Macs so expensive? Mac desktop prices rise while PC prices fall - why? Does the iMac's price take the shine off the aluminium finish? There are some good reasons not to choose a Mac when you buy your next computer, though in the last few years one of those most often given for sticking with a PC – that Macs are simply too expensive – has been rather inaccurate. Historically, of course, it was true that they were disproportionately expensive, but more recently the entire Mac lineup – in particular the portables and iMac lines – has come to represent at least 'good' value for money. When folks looked to Apple's US pricing and cried "rip-off Britain", they usually forgot two things. First, the dollar prices quoted on Apple's American site didn't include any tax – in the US, tax is applied at the checkout, and varies from state to state – and second, the exchange rates you find on internet sites such as www.xe.com never actually represent the kind of currency ratios that the man on the street would get. True, Apple remained one of the very few mainstream brands not to have a cheap, around £250, option at the bottom of its range, either as a budget choice for cash-strapped consumers or rather as a starting point for retailers – or, indeed, customers themselves – to upsell from. But then Apple CEO, Steve Jobs, has hinted (and sometimes flat-out stated) that the company isn't interested in producing cheap machines. As he put it, "We don't know how to make a $500 computer that's not a piece of junk, and our DNA won't let us ship that." (Reason to suspect, incidentally, that while Apple may indeed soon make a netbook in all but name, it's unlikely to have that most netbookian trait – a small price tag). And yet, with the latest round of upgrades to its consumer desktop machines, Apple seems to have been doing the tech equivalent of stuffing its fingers in its ears and loudly singing "la-la-la-la". It's not that they're bad machines: the Mac mini is just as cute as it ever was and packs a much bigger graphics punch than its ageing predecessor, while the iMac remains a remarkably beautiful, powerful all-in-one desktop. But the prices seem a little out of step with the rest of the market. 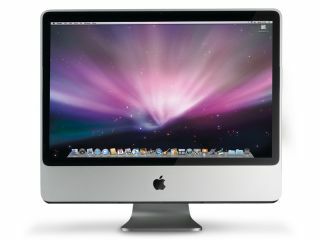 HIGH PRICE: Can the iMac's good looks still seduce in these difficult economic times? We're sure that there are smart people at Apple who have done the sums to demonstrate that the market will support these prices – and indeed the jump in UK pricing specifically looks, at least on the surface, to be simply a case of harmonising prices with America in the face of the weakening pound – but again, they seem steep. The entry-level Mac mini, for example, costs a not-extortionate £499, but you don't really get that much for your money. The processor's a 2GHz Core 2 Duo and it has a 120GB hard disk and a paltry gigabyte of RAM. While the current version of Mac OS X will run reasonably well with this spec – though you'll definitely start to feel the pinch of that RAM allocation if you want to run lots of apps at the same time – it looks like poor value next to bulkier, less charming boxes from, say, Dell. You could buy one of its Studio models for the same money with a 2.33GHz quad-core processor, 500GB hard disk and 3GB RAM. You could even purchase Dell's dinky Studio Hybrid model and, for £499, you'd get a slightly faster Core 2 Duo, another 40GB of hard disk space, double the RAM and an HDMI port to make it a genuine little Media Center PC. Never mind the fact that the Mac operating system doesn't integrate any TV tuners into its 10ft UI, Front Row, with anything like the grace of Media Center. Moreover, where the Dell's got an impressive 18.5in display, the Mac mini doesn't even come with a keyboard or mouse.